Home Domestic News Premier League Salah signs Liverpool five-year deal! Salah signs Liverpool five-year deal! Liverpool forward Mohamed Salah has signed a new five-year contract with the club. The 26-year-old Egypt international joined the Reds for £34m from Roma last summer and has scored 44 goals in 52 appearances for the club. “It demonstrates two things very clearly – his belief in Liverpool and our belief in him,” said Liverpool manager Jurgen Klopp. 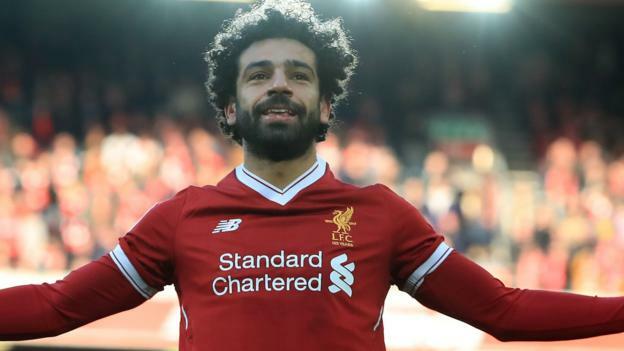 Salah was the top scorer in the Premier League last season as he netted 32 top-flight goals – the most by a player in a 38-game season – to win the Golden Boot. His performances also helped him win last season’s Professional Footballers’ Association Player of the Year award and Football Writers’ Association Footballer of the Year. “I think this news can be seen for what it is; rewarding a person who performed and contributed greatly for the team and the club last season,” said Klopp. Liverpool finished fourth in the league last season and reached the Champions League final, in which they were beaten 3-1 by Real Madrid. Salah had to come off after half an hour of the final against the Spanish side after suffering a shoulder injury following a challenge from centre-back Sergio Ramos. The problem put his participation at the 2018 World Cup in doubt and he missed Egypt’s opening game – a 1-0 defeat by Uruguay – before starting against Russia and Saudi Arabia. Salah scored in both of those games but could not stop his country from losing and going out in the group stages.